Photo: Takver. Creative Commons BY-SA (cropped). The current refugee crisis is the biggest since the Second World War, with 1,865 people having died in the last six months while crossing the Mediterranean. Due to the scale of this crisis, people in unaffected regions have come to associate the term ‘refugee’ with destitute migrants fleeing their homes and taking highly dangerous journeys to cross into Europe. 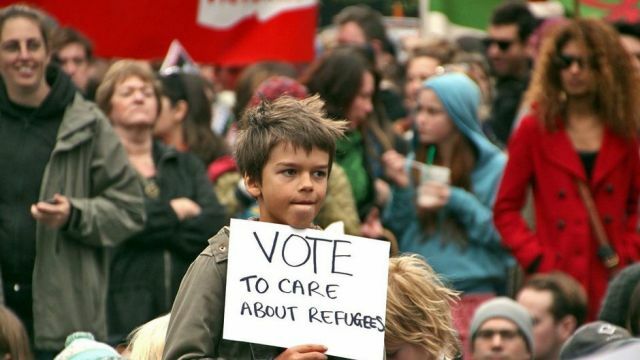 Refugees are often presented in the media and by a range of political parties as vulnerable, poor, benefit-dependent and a potential social and economic threat to the receiving society. They are subjected to media reporting that uses phrases such as “new migrant flood on way”, “illegal immigrants” and “refugee surge”. This can affect how local communities receive refugees and impede their social inclusion into the receiving country. A refugee is a person who has been forced to flee his or her home country and is unable or unwilling to return because of fear of persecution. Many refugees undergo traumatic experiences both in their home countries and during their journeys to reach their new country of residence. The basic rights of refugees are outlined in the 1951 Refugee Convention. Nevertheless, when refugees arrive in their host country, they can experience barriers to integration such as insecure legal status, poor housing conditions, a lack of access to education and employment opportunities and prejudice. In accordance with international law, most member states of the Council of Europe grant refugees the right to work. Many refugees arrive in Europe with a great diversity of skills, experience and specialisations that could make tangible contributions to the EU workforce. They are doctors, dentists, engineers, teachers, lawyers or IT and finance specialists hoping to rebuild the careers they had in their home countries before they found themselves forced to leave due to persecution, civil unrest or war. My first experience working with refugees was at The Refugee Council in London, which offers practical support and advice to refugees and asylum seekers in the UK. While working as a secondary school teacher and manager, I volunteered at the Refugee Council to deliver training sessions to refugees on the British education system. Most of the participants who attended the sessions had been teachers in their home countries. They were a diverse group of people who had taught in a range of settings and wanted information on how to enter the British education system and on what to expect once they found themselves working at a British school. In these training sessions I began to reflect on how valuable the representation of migrant teachers is in secondary schools in the UK. An increased diversity of school staff could bring new perspectives, facilitate the inclusion of students with a migrant background and help improve attitudes towards migrants. This experience also made me aware of the many challenges refugees face in taking up their careers again in the UK. These include having their qualifications recognised, improving their language and communication skills and obtaining work experience in UK schools. Entering the teaching sector was clearly going to be a long process; nonetheless, most of the participants were determined to make this transition. Although refugees have legal authorisation to work in Europe, many are not able to exercise this right in practice as they face a number of barriers to enter the work force. Many arrive without professional documentation and few have work references or knowledge of the host labour market. Those that do have professional documentation usually have to undergo lengthy, expensive and bureaucratic procedures for the recognition of their qualifications. Their chances of returning to employment often diminish the longer they are unemployed in their host country as they become de-skilled and lose confidence and self-esteem. Employment is crucial for the effective inclusion of refugees as it allows for economic and social participation as well as personal fulfilment. However, many skilled refugees experience high levels of unemployment and their skills are significantly underutilised as they are underemployed in low-skilled, temporary or low-paying jobs. They are often channelled down low skilled employment paths and are more likely to find employment in areas to which their community networks have access. In general, refugees are able to access the retail, catering, security and cleaning sectors more easily. Some manage to enter support roles, such as teachers working as teaching assistants or doctors working as lab technicians. In some instances such jobs can aid re-entry into their original profession. Others find an entry route by working in the voluntary sector. Here refugees can gain confidence, knowledge about the culture of the work place in their host country and, above all, work experience and references. This year at UNU-GCM our on-going research programme is on Female Agency, Mobility and Socio-cultural Change. The programme examines areas such as socio-cultural reconstruction of home and work and policy responses to female mobility. Female refugees often experience a combination of individual and structural factors that affect their labour market participation. They face many of the same barriers as male refugees trying to enter the labour market, which include language related barriers, knowledge of the labour market, recognition of qualifications acquired abroad and recent work experience. However, female refugees often bear caregiving responsibilities within families and can lack access to childcare facilities or social networks to facilitate their childcare, which can further limit their access to the labour market. Additionally, they may be subjected to institutionalised forms of gender-based discrimination that perpetuate inequalities. Female refugees on the whole are subject to high levels of downward occupational mobility and experience an underutilisation of their skills. Those with professional qualifications such as teachers, doctors and nurses are often not using their experience in their host country. They often experience gender barriers to employment and are more likely to be employed in ‘feminised roles’. Their low levels of participation in the labour market can lead to long-term deskilling. To facilitate their social and economic inclusion into a host society, women refugees need to be provided more opportunities to access services such as training, employment advice and language courses. There is a common misconception that, on the whole, refugees are a financial burden on European societies. However, in many cases refugees come with knowledge and experience of value to the receiving country and with a dedication to learn new skills. Refugees could therefore be a positive force for economic as well as human development if the barriers to employment were reduced. Employment provides an opportunity to fulfil personal aspirations, achieve financial independence, build social networks and to contribute to the economy and the community in empowering ways. Allowing refugees to access legal employment can benefit host societies in a number of ways. Utilising the knowledge, skills and training that refugees bring with them can help fill gaps in the labour market and if refugees are formally employed, they are able to contribute to social security and to the host country’s revenue. They can also bring new perspectives to workplaces and act as mediators in intercultural exchanges so that Europe’s socio-cultural diversity is seen in a more positive light. Research findings from the United Nations Refugee Agency (UNHCR) conference in 2013, entitled “A New Beginning: Refugee Integration in Europe”, found that most studies or integration evaluations do not consider refugee specific integration and that there is a lack of understanding of the barriers specifically affecting the integration of refugees. Some progress has been made with regards to overcoming certain barriers that refugees experience in entering the work force. In the UK, the Building Bridges Partnership was set up to support refugee health professionals re-qualify in the UK. As part of this programme, the Refugee Council runs free six-week preparation courses to help doctors demonstrate they have the key skills and knowledge necessary to practice medicine in the UK. A database established by the British Medical Association and the Refugee Council in 2008 currently has more than 1,300 refugees registered as doctors. Other organisations include Transitions, a social enterprise that provides advice and helps refugees find placements depending on their qualifications and skills. Transitions recently ran a seminar on women refugee professionals in the UK job market. CARA (The Council for At-Risk Academics) grants awards to refugee academics from early to advanced stages in their careers to re-qualify. One in three of the academics that apply to CARA for funding are female. They also have an employment training and education programme that provides refugee academics assistance with CVs, interview skills and one-to-one career advice sessions. What is most important is to continue to remove the barriers for refugees who want to work and to enable those with skills and qualifications to use them. Refugees are a diverse group and they have the potential to make a positive contribution to societies in a variety of ways. An increased understanding of refugees’ diverse backgrounds and how they enrich host communities would contribute to a more humanitarian and open-minded discourse and nuance the often simplistic discourses that are dominant in public life today. The Contributions of Refugees: Lifting Barriers to Inclusion by Alice Beste is licensed under a Creative Commons Attribution-NonCommercial 4.0 International License.